Ultimate castability; compact and lightweight, the Shimano Curado 300EJ Low-Profile Baitcast Reel features High Efficiency Gearing (HEG), Deep Magnumlite spool, Super Free (SF) bearing-supported pinion gear system, TI line guide, Dartainium drag, and SV Power Paddles. Safe in saltwater. With its higher gear ratio, the 300EJ is exactly right for the Terez Waxwing (sold separately). "I paired my Curado with a Carbon Fiber Lite Micro-Guide Rod and headed for the Ocean. My first strike was a Barracuda; it fought, bent the rod and provided me with a lot of fun. After landing the Barracuda, I caught many Sculpin, Rock Bass and other bottom fish. I got a good strike from a Yellow Tail, but it let loose before the hook set. 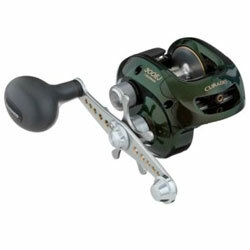 Bottom line, the Curado 300 EJ performed extremely well and provided maximum fun with frisky Barracuda."